May 2017 New Adventures Await You for Summer 2017 !! Think you have seen it all and done it all in the Gorge? Memorial Day weekend kicks off every type of summer fun adventure in the Red River Gorge and Natural Bridge State Resort Park! Everything you already love is open, plus there are some brand new adventures for 2017 you need to know about! You can now rent kayaks for paddling or fishing on beautiful Mill Creek Lake? SUPs – the latest, coolest water fun – are available for the first time? There’s a new shop in town that serious paddlers and fishermen (and fisherwomen) will love? You can choose between two ways to explore an underground cave? The remodeled putt-putt golf is fun for kids of all ages? One new adventure promises visitors “a ride they won’t ever forget”? Birch Hollow’s deluxe mountain homes are getting a fresh new look? Dale Smith has an amazing green thumb? 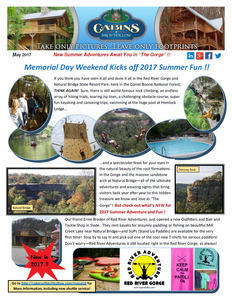 Please take a few minutes to catch up on all the new things happening here for Summer 2017 Fun and Adventure, and at your favorite cabin – and see what you are missing if you don’t book your Summer 2017 getaway NOW! What are you waiting for? CLICK HERE to plan an unforgettable mountain adventure this Summer, or during any season of the year! We promise to keep you updated on everything new in our neck ‘o the woods via our newsletters, Facebook, and our website, so stay tuned! Previous Post Choose the Best Deal for Your Red River Gorge Mountain Getaway! Next Post Happy Independence Day!